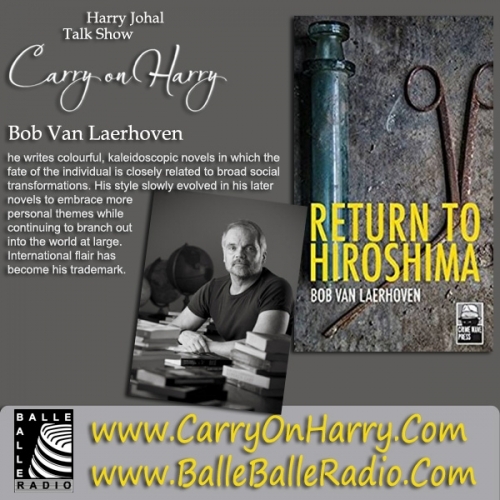 Studio CarryOnHarry Talk Show Guest Bob van Laerhoven was born on August 8th 1953 in the sandy soil of Antwerp's Kempen, a region in Flanders (Belgium),bordering to The Netherlands, where according to the cliché 'pig-headed clodhoppers' live. This perhaps explains why he started to write stories at a particularly young age. A number of his stories were published in English, French, German, Spanish and Slovenian. Van Laerhoven made his debut as a novelist in 1985 with "Nachtspel - Night Game." He quickly became known for his 'un-Flemish' style: he writes colourful, kaleidoscopic novels in which the fate of the individual is closely related to broad social transformations. His style slowly evolved in his later novels to embrace more personal themes while continuing to branch out into the world at large. International flair has become his trademark. Tensions are on the rise. A new World War is nearer than ever since the end of the Cold War. Democratic regimes seem to loose the battle against dangerous demagogic populists and dictators: Kim Jong-un in North Korea, Recep Tayyip Erdogan in Turkey, Vladimir Putin in Russia, and Viktor Orbán in Hungary, to name but a few. Never before was the turbulent Middle East such a chaos of shifting alliances and growing animosity. Iran and Saudi-Arabia are competing for hegemony in the region and build nuclear facilities that can be used to produce nuclear weapons. The US, Russia, and Turkey – with China looming at the horizon – support different factions in the civil war in Syria… They are allies today and enemies tomorrow. No-one seems to have a sound strategy, a solution, for the region. And that, my dear friends, is truly dangerous. Our leaders are not smarter, wiser, or more mature than we are. And they sure do not have more imagination… except in one area – their endless dreams of their growing power. I like movies and television series, even games and social networks, as much as anybody. But I notice that, when spending too much time with these media, my level of thinking is reduced to a receptive, confined mode. The essence of a story often slips away from me like water from a seal.